While the Big Four parties can paralyse the polity, they are also the only ones who can bring the country to a safe landing. The first (and foremost) hurdle to cross on the route to restoring stable politics in Nepal is to make operational the Constitution that was passed last year by an elected Constituent Assembly. The promulgation was followed by an eruption of violence in western Nepal and Tarai, and led to a border blockade that ruined the economy and silently wrecked countless lives. Prime Minister Pushpa Kamal Dahal’s opening order of business in his timebound nine-month tenure ought to be to recognise what caused that violence and hostility, and address the root grievances. Some of these were popular dissatisfaction in the plains with the way Nepal’s governance and decision-making has been centralised and monopolised by Kathmandu. But he will also have to look at the geopolitical ramifications of why the Madhesi parties were backed by India, as well as try to understand New Delhi’s concerns and allay them. It will be tricky and ill-advised for him to move ahead without looking at the domestic and cross-border antecedents to the Tarai violence and the blockade, because they hold important lessons about the amendments that need to be agreed to before the Constitution is finally a working (and workable) document. There is a deadline of mid-January 2018 for local, provincial and parliamentary elections in order for the Constitution to be in full force. The initial step is to get the Madhesi parties on board in government. Cynics will say that Madhesi leaders are only interested in plum posts, and this may be true. But it is also undeniable that including them will be politically expedient — elections would not be possible without addressing their demands for modifications to reform the constitution. The second step, and this may be even more onerous, is for Dahal to win the trust of KP Oli of the UML, a person whom he just ousted. The UML and the RPP-N (the second and fourth-largest parties in parliament, respectively) command an important swing vote even from the opposition bench, in pushing through amendments. This means the future of the country is in the hands of the four main parties — whether they be in government or out. The past decade of post-war transition has proven that just as the four parties can paralyse the polity, they are also the only ones who can bring the country to a safe landing, if they act collectively. By supplanting Oli and forging an unwritten agreement with the Nepali Congress for rotational prime ministership, Dahal has also inherited the task of ensuring that the three elections are held. Inability to hold elections will throw the Constitution into limbo, and could have unpredictable and unimaginable consequences. In that period, if ethnic, religious or nationalist factors that simmer under the surface are added to the volatile political mix, it will only allow dangerous rightist or fascist forces to take hold. Such an outcome would not benefit anyone in Nepal, nor will it be in the interest of Nepal’s big neighbours, which ostensibly prefer stability and predictable politics in Nepal. If elections are not held by January 2018, the country will be without a parliament, which could invite a similar outcome as the appointment of Chief Justice Khil Raj Regmi as prime minister in 2013. It is the responsibility of the current political leadership in both the government and the opposition to prevent such a perilous eventuality. Alas, the inter- and intra-party feuds within the Maoist Centre, NC and the Madhesi Front in the past two weeks do not bode well for stability. It seems no lessons have been learnt, and short-term power games still prevail, with scant attention being paid to averting the political cliffhanger we will face in a little over a year. Already, the politicians and wannabes seem oblivious to the fact that there is a high-handed parallel government running in this country that has the police, bureaucracy, politicians, media and even parliament in its vice-like grip. The Maoist-NC partnership was touted as a way to bring the Madhesi and fringe parties into the mainstream to activate the Constitution. That premise is already looking like wishful thinking. By now there should have been serious negotiations about amendments to the Constitution, but all we have is backroom haggling over the doling out of ministerial posts. 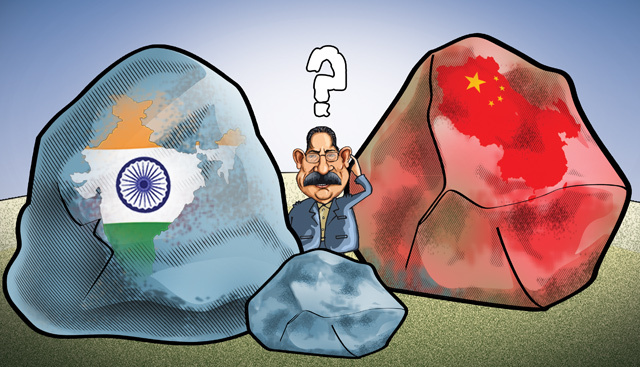 Just about the only decisive option Dahal has been able to take was to send his two Deputy Prime Ministers, one north and the other south, to assuage our nervous neighbours. The Prime Minister should know that Nepal’s problems are located within the country, not without. But his action is proof — if indeed proof were still needed — that Nepal’s domestic politics is a mere plaything in the hands of outsiders. Nepali tea growers believe their cuppa could prove more potent economically than even carpets. But they need a little help. As research-oriented, software development jobs are difficult to get, Nepali companies are gunning for labour-intensive IT-enabled services. The Nepali film industry seems to be finally coming into its own. The success of Darpan Chhaya and the censor row over Aago have given Kollywood a new boost. The problem of Nepali tourism isnt that Indians arent coming, the real problem is that deep down we do not seem to want them.